Pattypan squash is usually found as a small vegetable that looks a bit like a spinning top or flying saucer. I have seen it in yellow most commonly, but also green or white. They are often found in late summer. I have usually seem them as quite small but you can find larger patty pan squash. The larger ones are obviously easier to stuff. Remove a slice from the stem end of the squash. Scoop out the pulp, leaving a 1/4 inch shell around outside. Repeat the procedure with the remaining squash. Chop up the squash pulp that you have scooped out. Sauté the mushrooms, green onions and squash pulp in 1/4 cup of butter in a large skillet, for 8 minutes. Add the cooked rice and the broth. Add pepper to season to your taste. Mix it all together well. 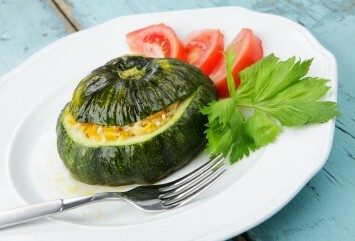 Place the squash shells in an baking dish. Spoon the rice mixture into the shells. Dot with the remaining butter. Pour water 1/2 inch deep into the baking dish. Cover and bake at 350°F for 50 minutes or until tender. Sprinkle with paprika to serve. You can certainly use other varieties of squash in this recipe. If you are using a larger squash, like a butternut squash or larger pepper squash, you will need to cut it in half first before scooping out the seeds and stuffing it. Replace the chicken broth with vegetable broth to make this a vegetarian recipe. This recipe is made for the larger squash. You obviously wouldn’t get much from stuffing four tiny squash, but if you are using the smaller patty pans, you can still use this recipe. It will just be fussier to scoop them out and stuff them because they are small. You will also need many more squash than just four. I would estimate about 16 to 20 or more depending on the size of the squash. You can also use this stuffing to stuff pretty much any type of squash. Butternut squash would taste great baked with this stuffing in it, as well as pepper squash, acorn squash or most other varieties you will find in your market. You can easily make this into a vegetarian recipe by replacing the chicken broth with vegetable broth. It makes a fantastic vegetable side dish recipe or a main course to a light vegetarian meal paired with a salad. If you like this recipe, I’d love you to Pin it to Pinterest, Tweet about it, Like it on Facebook and leave a comment below. Sign up to the site here and be the first to get new recipes and tips. If you love pattypan squash, you will probably like our citrus butternut squash recipe too. Find it here. Browse all of our delicious vegetable recipes here.